While I do think “doing the same old thing” can be a big part of day to day operations I also believe that it can turn a great place into a “place that used to be great but know they’re “ok.” This is the reason why Pappagallo’s Satellite Beach tries so hard never to sacrifice our standards to make temporary gains in the marketplace. There is a place for the “best price” out there. There is a certain part of potential marketplace that is only concerned with price alone, this is the reason for 99 cent hamburgers and buy one get one pizza places. Pappagallo’s Satellite Beach has always tried to keep our prices as low as possible and I have personally struggled with trying to keep our menu prices reasonable while never sacrificing quality of our food. Pappagallo’s Indian Harbour Beach started in March of 1990. in 1990 an average house in our area was around 100,000 dollars. A nice car was 15,000 dollars, minimum wage was under 4 dollars an hour. Gas was just over a dollar a gallon. I’m not an economist but think about that a second… every benchmark price I just mentioned is 3-4 times higher than back in the 90’s than it is today. The exception being wages and our menu prices, I didn’t even factor in how many more fees and licenses they are today versus 1990. The skyrocketing cost of insurance and how much more the actual space we occupy costs a month. Pappagallo’s Satellite Beach is obviously not the only restaurant or business, for that matter, to try to deal with all these rising costs of doing business. Everyone from any line of work has had to make major changes in the way we operate in order to just keep our doors open. Now that I’ve painted a really grey picture of what the business side of our world looks like. 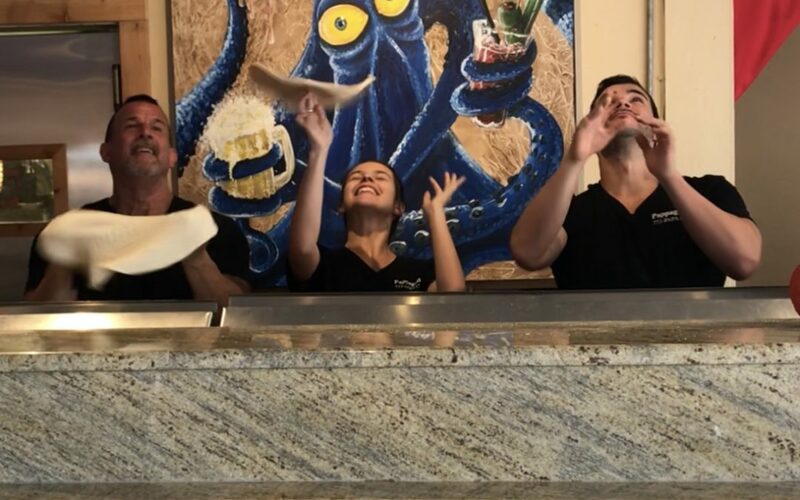 Let me be clear, that I think this is a very good thing for Pappagallo’s Satellite Beach as a business and for our guests as they continue to support us on a daily basis. So the question is, how do we keep doing what we do when everything seems to be getting tougher? Simple answer is we have to get better and we have to work harder. Let’s be honest how many of you can honestly say that they don’t have to work harder now to maintain your standards than your parents or grandparents did to maintain theirs. No disrespect to any previous generation but the world is tougher now and way less forgiving than it was back in 1990’s. I truly believe that has made Pappagallo’s Satellite Beach a better version of itself. In order to survive we’ve had to get better at everything we do on a daily basis. We have to be better more efficient cooks, we have to be better with our guests so that they remain our guests, prices have to stay competitive without sacrificing quality, and we have to provide new additions to our menu and our actual physical space (by space I mean constantly upgrading our actual restaurant operation with new equipment and improved technologies to keep us up with the times.) Pappagallo’s Satellite Beach started at a time when smart phones didn’t exist. Internet wasn’t a thing yet. Point of sale systems weren’t invented yet. Basically every bit of technology that we take for granted ,that makes our lives easier is less than 30 years old. In the early days phones were answered by an actual human (of course we still do this but web based ordering will replace a major portion of that over the next few years) after the person wrote down your order by hand she or he was far from done taking your order, after the order was dictated we had to write it specifically so the kitchen could understand what was ordered. Phone person than had to price each item individually then add tax and than give the customer a correct total. If it’s for delivery they had to hand write all the info, hopefully with perfect accuracy, and then promise an acceptable delivery time. I think you can imagine how much longer this takes than our current system. Internet ordering allows orders to just print without the phone even ringing. As a business owner that’s a great innovation, as a human being it scares the heck out of me. If you ever want to see chaos be in any of your favorite restaurants and watch what happens when the computers go down during a rush. A well oiled machine that was humming along a few minutes ago will come to a screeching halt! Not because we forgot how to cook but because no one has had to actually do the ordering procedures by hand for years. I think the advances our industry has made an immeasurable difference in how we are able to serve our guests. I think that if Pappagallo’s Satellite Beach continues to add technologies and upgraded equipment we can continue to improve our service without ever having to sacrifice quality. At the end of the day it’s about the pizza, pasta, salad or the lunch or dinner you’re enjoying. The guy who order his pizza from his smartphone while sitting in traffic in his electric car being guide home by his GPS, may not even realize all the advances he’s enjoying. But rest assured when he gets home he expects the same homemade quality meal from Pappagallo’s Satellite Beach that his parents got before he was even born. Pappagallo’s Satellite Beach will always use any advances that improve our service and commitment to quality. But until they can make a pizza robot that can keep up with me behind the pizza line on a busy Friday night, you’ll still see me back there doing things the old fashion way… by hand. Because as of this moment that’s still the best way to get what I love to do -done right.